Lykle de Vries | So proud of my brother, he has a town with his own name! So proud of my brother, he has a town with his own name! As you know, my brother Martin and his friend Tom are on a motorcycle trip to Kazahkstan and back. The trip takes them through 15 countries, one of them being Croatia. 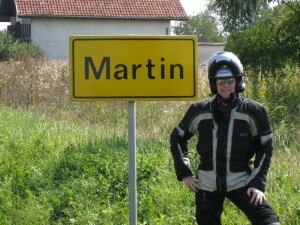 Where Martin discovered a town that shares his name. The Around2seas trip supports the fight against cancer. Click on the map to donate!